For many of us, the New Year represents a clean slate and a chance to begin some self-improvement. But instead of setting a list of unrealistic resolutions that you probably won’t stick to, why not take a look at some simple, positive changes you can make to your parenting? Of course, there is no right or wrong way to raise a child, no matter how much we strive for perfection. However, there are some things we know we could and should be doing to improve our relationships with our children. 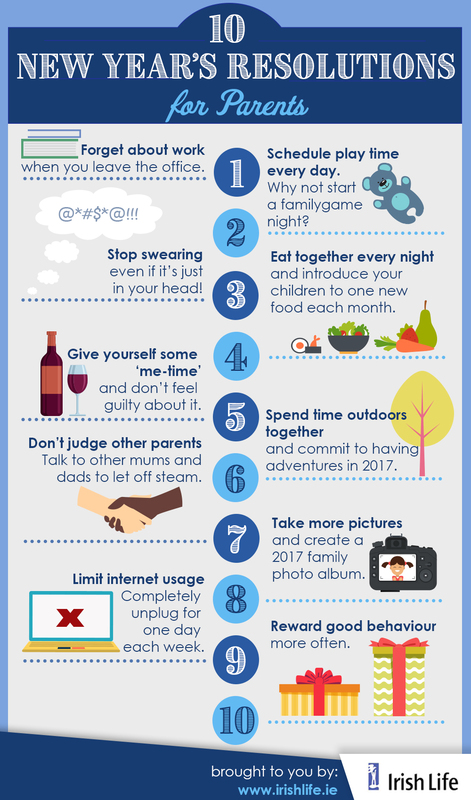 To help you out, we’ve compiled a list of 10 easy New Year’s Resolutions that all parents can make and keep. This New Year, try to be a little easier on yourself and other parents and take those all-important steps towards more quality time as family. What are your New Year’s Resolutions as a parent? Let us know on Facebook, Twitter and Instagram, by using the hashtag #MyIrishLife.